They have hit 88 HRs in 52 games or about 1.69 per game. If they do that for the entire season, they will end up with 274 HRs, beating the record of 264 held by the 1997 Mariners. There is still a long way to go, of course. But so far this is very impressive. They also have 123 doubles to lead the league. At the pace of about 2.37 per game, they will hit 383 this year, beating the record of 376 held by the 2008 Rangers. Also impressive is their team isolated power (ISO) of .227. ISO is slugging percentage (SLG) minus batting average (AVG). 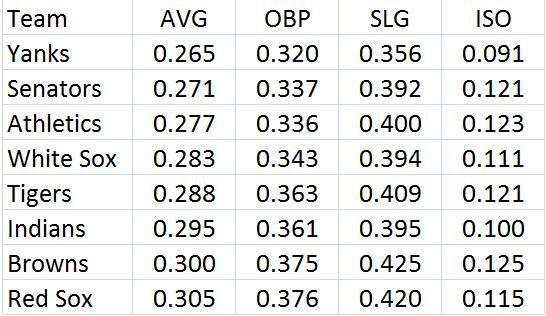 It is a better measure of power than SLG since it is extra bases per AB. The Blue Jays have a .471 SLG and a .244 AVG. That gives them a .227 ISO. If they finished the season with that mark, it would also be an all-time record. 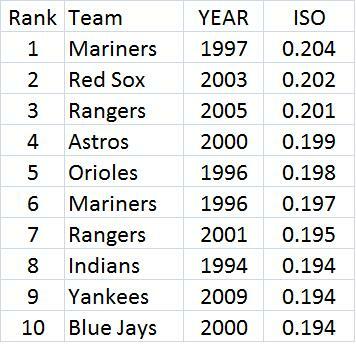 The table below shows the top ten in team ISO in AL & NL history. The Blue Jays are way ahead of the record right now. Just imagine how many runs they would be scoring if their team on-base percentage was not 20 points below the league average (.310 vs. .330). They are second in runs with 271. 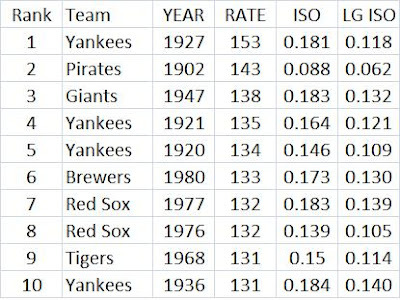 The next table shows the top ten in team ISO relative to the league average in AL & NL history. 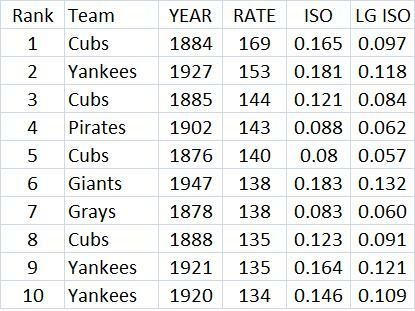 The 1884 Cubs had a .165 ISO while the league average was .097 (they were actually called the White Stockings at this time). Since .165/.097 = about 1.69, they get a rate of 169. The AL ISO this year is .148. So the relative ISO for the Blue Jays is 153. That would rank them very high. In 1884, balls hit over a fence of the Cubs park that was only about 200 feet away were called HRs instead of doubles as they were in other years. So Ned Williamson hit 27 HRs that year. I think some other Cubs hit over 20. The next table shows only the top ten since 1900. On May 23 I reported that their OPS relative to the league average was just 81. Now their OPS is .605 while the league OPS is .731. The ratio is now .8276. Multiplying that by 100 and rounding gives them a relative OPS now of 83. That would still be the lowest ever in either the AL or NL. 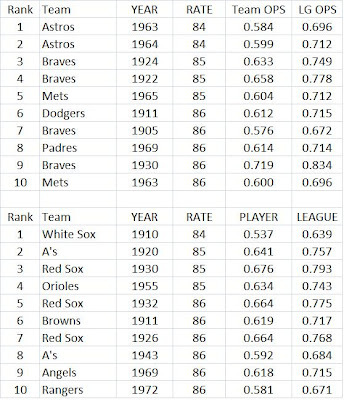 See the May 23 post Astros Offense On Record Setting Low Pace which shows the worst 10 teams in both AL and NL history. The Astros now have an OPS+ of 62. See this Baseball Reference link. The lowest team OPS+ I found going all the way back to 1920 was 69 for the 1920 Philadelphia A's. The next lowest so far this year in either league is Pittsburgh with 80. 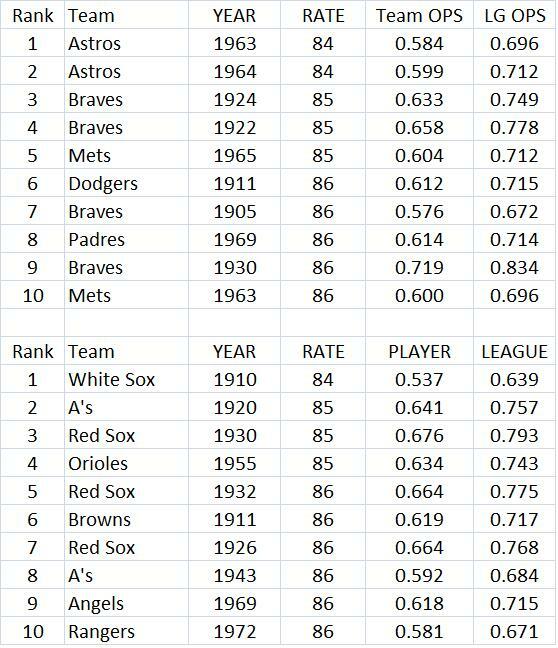 How Important Was Team OPS Differential In The 1920s? where pct is team winning percentage. The r-sqaured was .866 (meaning that 86.6% of the variaion in winning pct across teams is explained by the equation) and the standard error was .033. Over 154 games, that is about 5.12 wins. There were 160 observations, one for each team in each season. The 1927 Yankees had the highest differential of .196. Their hitters had an OPS of .872 while their pitchers allowed only a .676 OPS. The .872 was the highest of the decade, with the 1929 A's 2nd at .844. The .676 they allowed was the 7th lowest of the decade. The next highest differential, which also belonged to the 1929 A's, was .123. The equation predicts the 1927 Yanks to have a pct of .769, far higher than their actual .714. Could they have been even better than we thought? In this case there were only 16 observations. The r-squared was .969 and the standard error was .012 or about 1.87 wins per 154 games. The better r-squared and standard error are probably due to averaging each team's yearly results. That helps flush out some of the randomness. So the averaging method lowered the value of the OPS differential slightly. But in the 20s, the averaging method raised the value of the OPS differential. I don't know why things would go in different directions in the two cases. I also don't know why the OPS differential was more valuable in the 20s in either case. Maybe it has to do with relief pitching. The 1920s team that exceeded their predicted pct using the averaging method the most was the Senators. Their average OPSDIFF was -.0036 which projects to about a .495 pct while it was actually about .519. So they were about .024 better than predicted. The Senators did have one of the early relief specialists for most of the decade, Firpo Marberry. 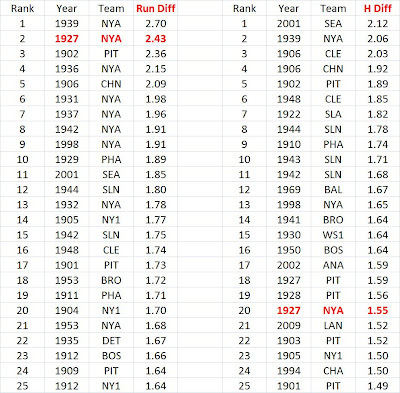 Using the single season equation (.5 + 1.37*OPSDIFF), the Senators had 5 of the 20 best seasons in terms of winning more than expected, including the 3rd & 4th best. Marberry was on them for four of those seasons. I don't know if he had anything to do with them winning more than expected, but it is possible. The next best over achievers were the Cubs who had a pct of .526 while they were predicted to have a .507. So they were .019 better than expected. But now their OPS is down to .590 while the league OPS is .733. The ratio is now .8049, just a little lower than a week ago. Last week's post Astros Offense On Record Setting Low Pace shows the worst 10 teams in both AL and NL history. The Astros now have an OPS+ of 58. See this Baseball Reference link. The lowest team OPS+ I found going all the way back to 1920 was 69 for the 1920 Philadelphia A's. In discussing how well the Rays are doing this year with their +95 run differential, ESPN's Tim Kurkjian said that they probably will not break the season record held by the 1927 Yankees of 371 (actually they had 376). But the 1939 Yankees had a run differential of 411. That is the record. They scored 967 while allowing 556. That predicts the Rays to have just a .602 pct for about 24 wins, not the .725 and 29 wins they actually do have. With runners on base, the Rays have a .831 OPS while allowing their opponents a .604 OPS. They have a team OPS of .597 while the NL average is .735. So they have a rate of 81 (.597/.735 = .81, which is 81 when multiplied by 100). 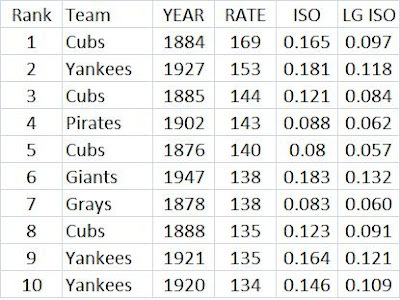 The table below shows the ten worst seasons in OPS relative to the league average in both the NL and AL since 1900. Data from the Lee Sinins Sabermetric Encyclopedia. But the news is even worse for the Astros. In April, their team OPS was.609 while the league average was .737, So they had a rate of 83.3. In May, their team OPS has been .578 while the NL average is .732. That gives them a rate of 79. So they are going in the wrong direction. Well, you may know some of this. And even if you don't, some of it won't be a surprise. But this was fun to put together. For one, they out homered their opponents 158-42, for a differential of 116, the highest ever (the 1961 Yankees are 2nd with 103 and the 2005 Rangers are the only other team with 100 or more at 101). 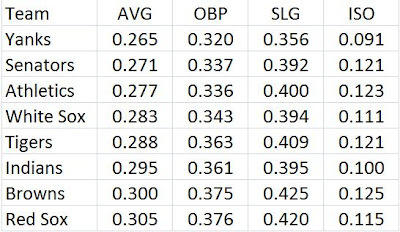 As you will see below, it is also the highest HR differential per game by a wide margin. 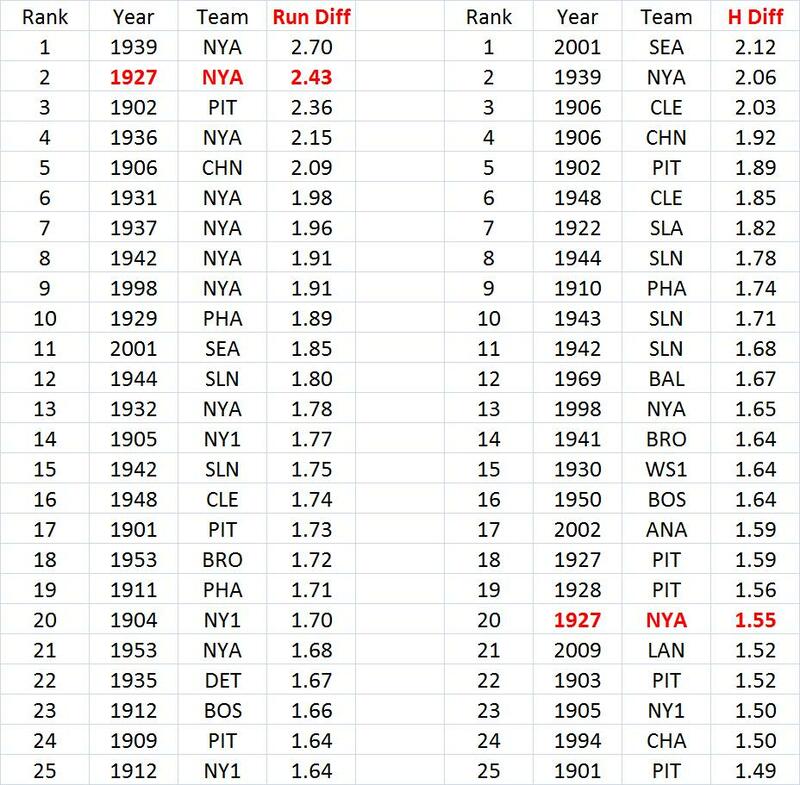 The graph below shows where they rank in terms of run differential per game and hit differential per game among all teams since 1920. Pretty good. Second in run differential and 20th in hit differential. The team called NY1 is the New York Giants. 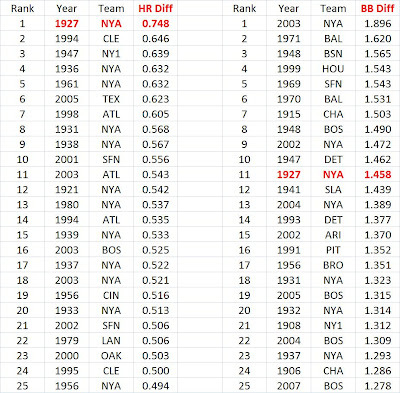 The next table shows where the Yankees rank in HR differential per game and walk differential per game. Their HR differential per game is 15% higher than the next team. 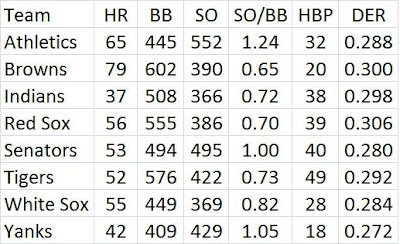 The next table shows what the Yankee pitchers gave up. They were lowest in all 4 stats. If you take both what the Yankee hitters did and what their pitchers allowed out of the league average, the AL had an OBP of .352 that year and an SLG of .391. 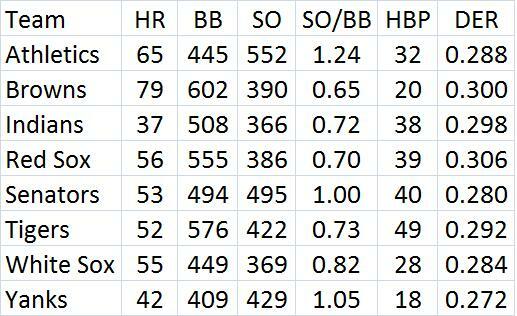 So their pitchers were .032 better than the league in OBP and .035 better in SLG. The next table shows some other stats allowed by the Yankees. They allowed the fewest walks, the second fewest HRs, had the second highest strikeout-to-walk ratio, by far the fewest HBP and had the best defensive efficiency ratio (the percentage of batted balls turned into outs). They also allowed only 177 sacrifice hits, the lowest in the league (the rest of the league averaged allowing 210). I guess with all the leads they must have had, other teams did not like to sacrifice. The 1927 Yankees struckout 610 times to lead the league. The next highest team total was 476. The Yankee pitchers only struckout 431 batters. So they struck out 179 times more than their opponents. 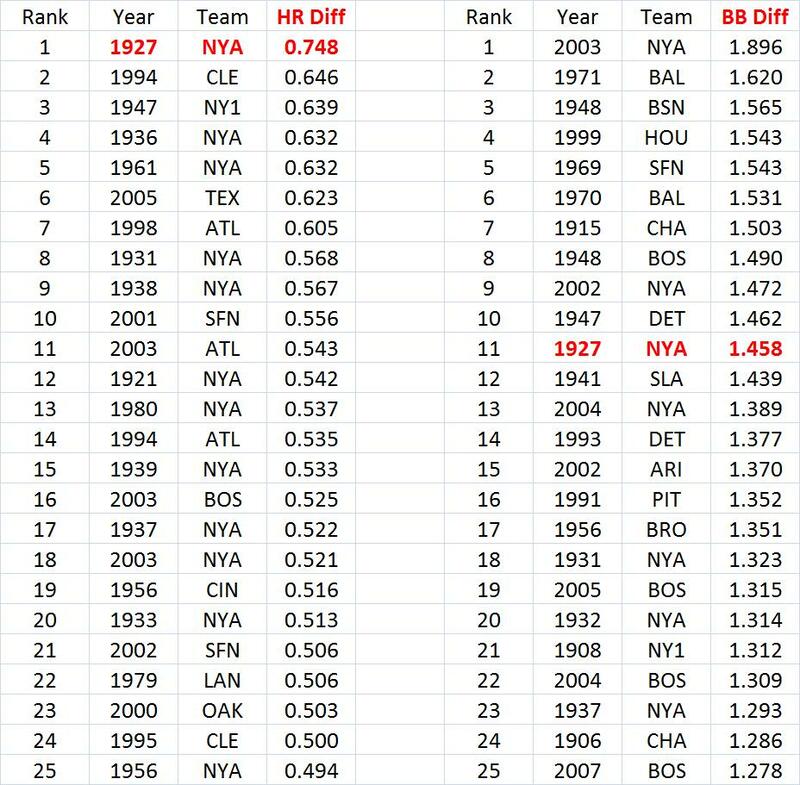 Where NONHR are all hits that are not HRs (in case you are wondering, the 27 Yanks ranked 215th in NONHR since 1900 differential per game at .806, still in the top 10%). Each stat was a team's differential per game. It predicted that the Yankees would have had a .744 pct, the highest predicted pct since 1920. The Yankees had a team OBP of .384 and a team SLG of .488. So their OPS was .872. Then minus the OPS they allowed (.676), leaves .196. That would predict them to have a pct of .737.